This section shows a procedure for updating the configuration parameters of the BM70 module using the BM-70-CDB. Android device running Android 4.3 or later version. Windows host PC with USB port. Download and install the latest firmware and corresponding tools (Firmware_SoftwareTools_Vx_xx.zip) from the Microchip website: www.microchip.com/BM70. Firmware hex images (*.H00, *.H01, *.H02, *.H03). Ensure the latest firmware is downloaded to the IS1870 IC on the BM-70-CDB. The initial BLE firmware version programmed into BM70 modules in Microchip's manufacturing line at the time of releasing this product to market was version 1.03. The latest firmware is made available on the BM70 product web page on Microchip's website. 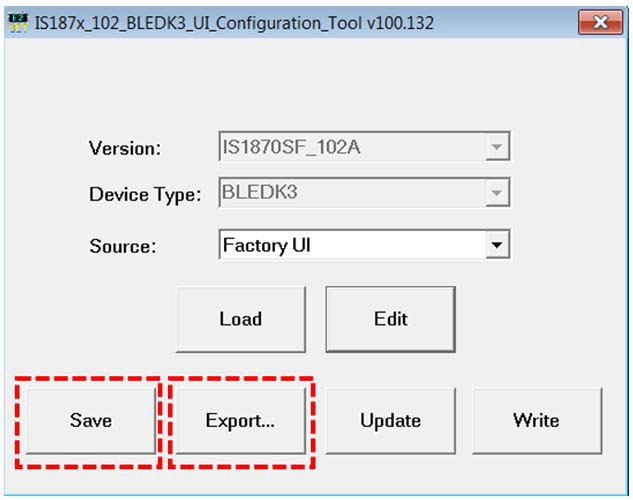 Ensure that the exact version of the Configuration tool (UI Tool) matches the specific firmware version programmed into the IS1870 IC's Flash memory is used to configure the module. For ease of use, the UI tool, firmware and firmware update utility are all provided in a single zip file for each version of firmware released by Microchip to the website. 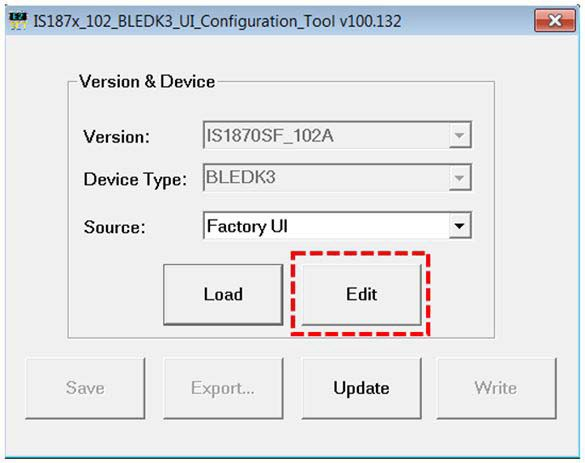 The latest firmware for the BM70 module is not compatible with older versions of the Configuration tool. To ensure the correct version of firmware and tools are being used together, a Firmware_Software_Vx_xx.zip file is provided. This archive contains firmware along with the compatible software tools for this specific firmware version. 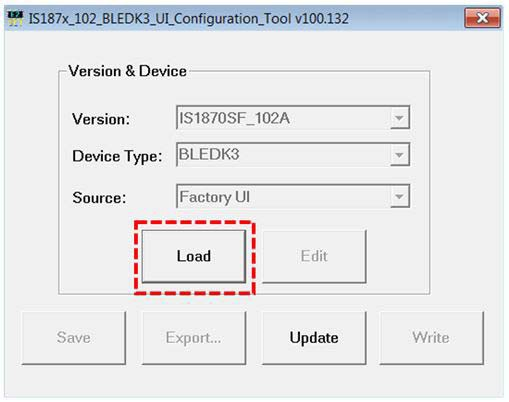 In the following example, the BM-70-CDB with firmware version 1.06 and Configuration tool (IS187x_102_BLEDK3_UI v100.132.exe) is used. Add or edit GATT service table. Open the UI tool and click Load, see Figure C-1. The Loading Option window is displayed. Download and unzip the contents of the Firmware_Soft-ware-Tools_Vx_xx.zip file, which is available at the Microchip website: www.microchip.com/BM70. 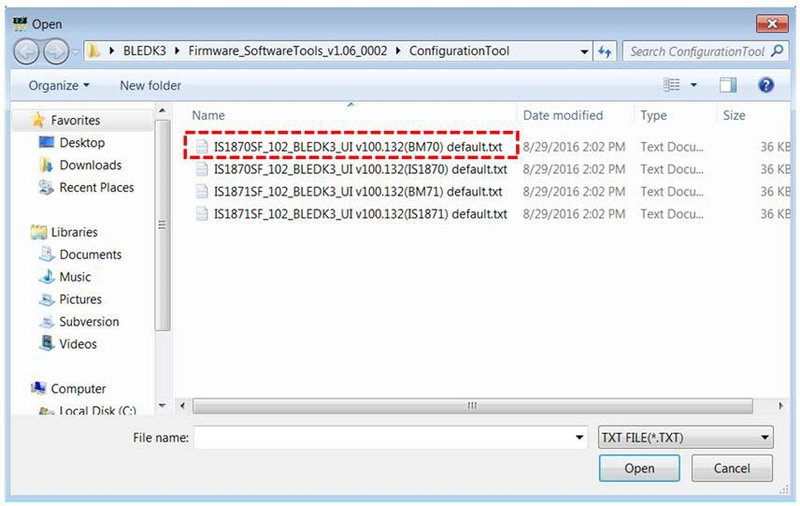 The configuration tool is part of this zip file content and located under the sub-folder "ConfigurationTool/". 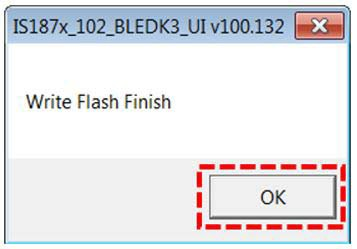 In this demonstration, the IS187x_102_BLEDK3_UI v100.132.exe tool is used. 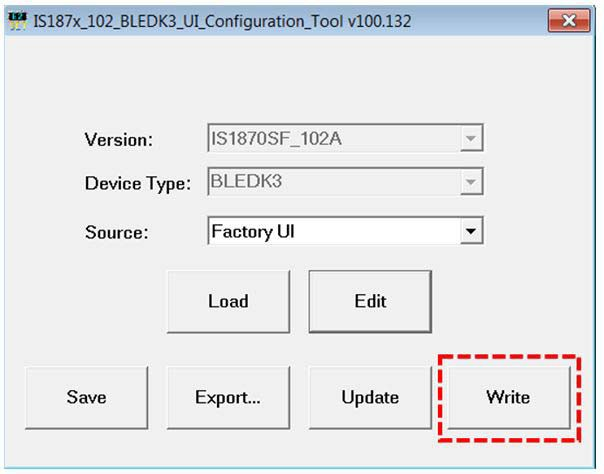 This tool version corresponds to firmware version v1.06. This information is shown in by the file name, Firmware_SoftwareTools_Vx_xx.zip, where "Vx_xx" is the firmware version. In the Loading Option window, click Load Text File to load default configuration parameters, see Figure C-2. From the Open dialog, select the default configuration parameter text file (provided with the Firmware_SoftwareTools_Vx_xx.zip file under the "ConfiguartionTool/" sub-folder) and then click Open, see Figure C-3. From the Configuration Tool window, click Edit to start editing the default parameters, see Figure C-4. From the Main Feature window, click BLEDK and then click OK, see Figure C-5. The UI tool displays a window with various configuration options (tabs) in tabular format. Click the System Setup tab, and in the Name fragment box, type “BM70_BLE” (or any user-defined name), as shown in Figure C-6. Click the Help button to get information related to UI parameters. 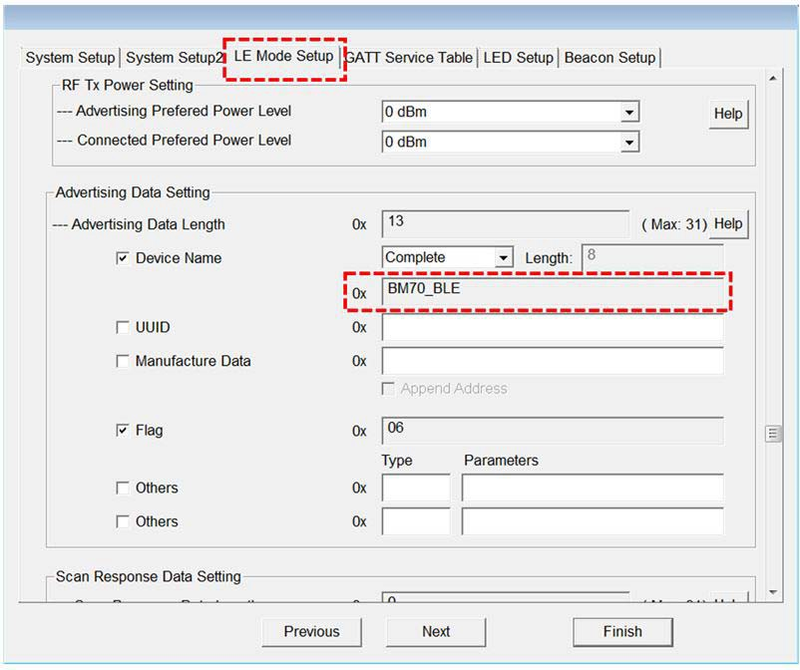 Click the LE Mode Setup tab and under the Advertising Data Setting section, select Device Name to advertise the device name, as shown in Figure C-7. This ensures that the name fragment is included in the advertising packet. Click Finish. The Configuration Tool main window is displayed, see Figure C-8. Click Save to save the selected parameter settings as .txt or .hex files (for later production programming). Click Export to export a log file along with the parameters to a .txt file. The log file contains the settings of configuration parameters, which were edited. Press SW1 (Reset) button and verify that LD2 is showing a non-flashing blue that indicates the BM70 is in Programming mode. 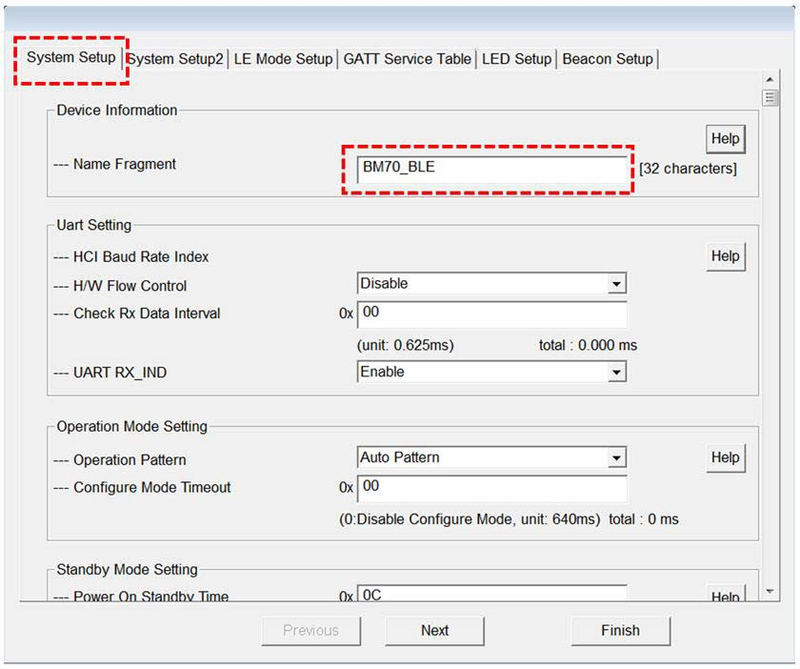 Go to the Configuration Tool window and click Write to program the settings into the internal memory of the BM70 module, see Figure C-9. 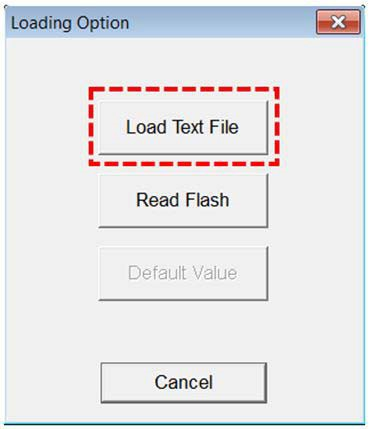 The Read/Write Flash window is displayed. 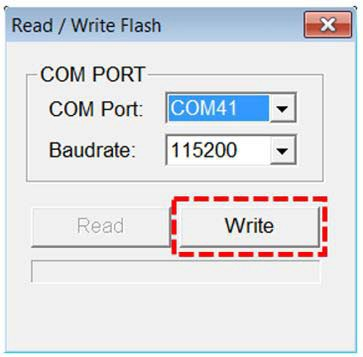 Select the values for COM Port and Baud rate (must be 115200 for the configuration to succeed), and then click Write, see Figure C-10. A message box will appear displaying the message “Write the UI configuration settings to EFLASH! Are you sure?”. 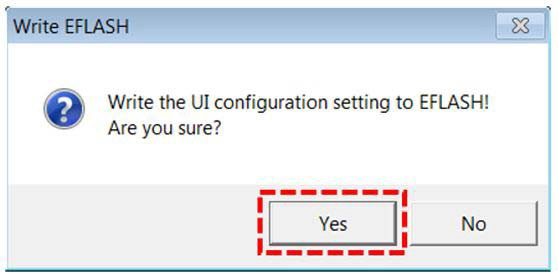 Click Yes to write the configuration, see Figure C-11.